Do any of you watch Masterchef? It's this show on Fox where home cooks compete to be the best amateur cook in America. Being an amateur cook/baker myself, I find it quite interesting with what these random people are able to come up with. Some of the competition revolves around coming up with their own dishes, but during something called elimination "pressure tests", the cooks must duplicate a specific item (or two or three) for the judges. A couple weeks ago, the cooks had to execute a lemon meringue pie. 3) Although I've made pie and lemon curd before, I've never made meringue. Considering my previous failures with things involving egg whites (AHEM MACAROONS), I considered it a challenge. I'm not even going to show a high quality version of this picture because your eyes might be scarred for life. Ok, number one, I didn't have a LOT of crust, so it's kind of hidden. And I tried piping the meringue to achieve the "peaks". Then when I transported it to it's eating destination across town, the meringue was sliding all over the place on top of the curd and ended up looking terrible. Upon eating it was TAAAART. So tart. Like, I thought I put enough sugar in it to cut the tartness of the lemon, but it sure didn't taste like it!! I was like, "so this tastes good...maybe?" I knew that I needed to give this another try, with the correct ingredients, AND a special helper: MOM! I knew she'd be helpful, even though she claimed the first time she made this pie, she was 15 and all the neighbor kids were swarming around the kitchen and it ended up in the garden it was so bad. "The crust had holes in it, so the lemon sank through, and then the meringue was like floating in clumps!" Good for her, she claims that she has made successful lemon meringue pies since then. Looks better, no? I did not pipe the meringue this time, and just used a spoon to make the little peaks. It may have overbrowned just a tad. And the taste? MUUUUCH better this time. The lemon was smooth, sweet, and not overtart. Just perfect! The only things to improve on: The crust needs to be more uniform and maybe not fluted, so the meringue would have less of a chance to separate from the crust. 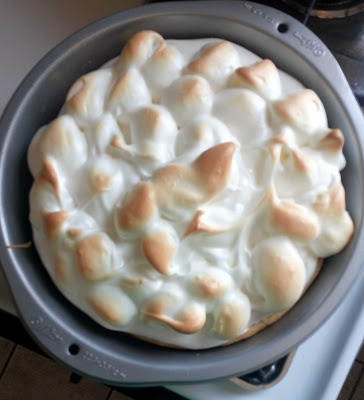 (It's supposed to be touching) I THINK the consistency of the meringue is ok, but sometimes it's hard to tell! It wouldn't cut perfectly like the picture in the book, but it's not too bad. Have you ever made any meringue pies before? Any tips or fellow horror stories? Let me know in the comments!! Pastry: Preheat oven to 400 degrees F.
1. Mix flour & salt together. Cut in butter with pastry cutter until pea sized. Sprinkle 1 tbsp of water over the flour mixture & gently toss with fork. Push moistened dough to the side of the bowl. Repeat with 1 tbsp of water at a time until all the flour mixture is moistened. Form dough into a ball. 2. Roll out dough and place into pie pan. Trim edges at 3/4". Fold the overhang under to form an edge that rests on the lip of the plate. Finish by fluting the edges or pressing into the edge with the tines of a fork. 3. Prick the pastry all over with a fork. 5. When finished, transfer pie to wire rack to cool. Filling: Reduce heat of oven to 350 degrees F.
1. In heavy saucepan before heating, whisk together sugar, cornstarch, & salt. Whisk in the water until completely smooth. Turn on the heat to medium high heat. Whisk constantly as you bring mixture to a boil. Lower the heat slightly, and whisk constantly until very thick, smooth, & translucent, about 2 minutes. 2. Remove pan from heat. Whisk in butter until melted. 3. In deep medium bowl, whisk egg yolks until blended. Slowly pour about 1/2 cup of the hot cornstarch mixture unto the yolks, whisking constantly and vigorously (you don't want the eggs to cook & scramble). Whisking vigorously, slowly add the yolk mixture back to the main saucepan cornstarch mixture until well blended. 4. Return the saucepan to medium-high heat and bring to a boil, whisking vigorously and scraping pan bottom, until mixture boils for a full 2 minutes. Don't undercook, as the filling may thin out later. 5. Remove from heat and whisk in the lemon juice and vanilla. 6. If you have any cooked egg chunks in your mixture, strain filling through fine sieve. 7. Whisk in lemon juice. Taste. If it needs more sugar or lemon juice, add now. Cover & set aside. 1. In a completely grease and moisture free large bowl, combine the egg whites, cream of tartar and salt. 3. Immediately add the powder sugar 2 tablespoons at a time, beating for about 20 seconds after each addition. 5. Raise speed to medium-high and beat for 2 1/2 minutes, scraping sides of bowl as needed. Raise speed to high and beat for 1 minute longer, until meringue if fluffy and stand in firm but not dry peaks. 1. If lemon filling is too cool, warm over medium heat until hot again. Turn out filling into the pie shell, spreading to even surface. 2. Spread about half of the meringue over the filling, making sure the meringue touches the pastry shell all the way around. Add the remaining meringue, mounding it slightly in the middle. Attractively swirl the meringue with the back of a large spoon. 3. Bake for 12 to 17 minutes on middle rack in oven, or until the meringue is cooked through and evenly tinged with brown all over. 4. Let cool for at least 2 hours and then refrigerate until completely cold before covering, this will reduce the beating and weeping of the meringue. 5. The pie will keep, covered, in the refrigerator for 3 or 4 days. Thanks so much for visiting. I really appreciate everyone who reads and comments. If you like what you've seen here, please follow me on Facebook and Pinterest to receive updates.